Google Chrome is the leading internet browser by market share and just like every internet browser, allows a user to save their favorite sites as bookmarks, but it does so in a unique way. A common, albeit not default use case, is when a user has just created a folder with the intent to add one or a number of bookmarks to it immediately after creating a that folder. 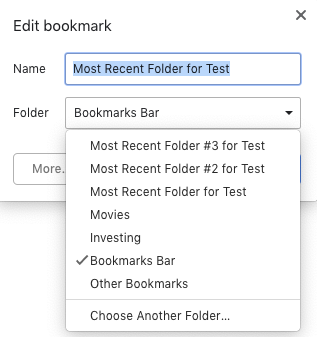 This use case makes intuitive sense - users are typically either creating folders in a browser bookmark manager to either organize previously created bookmarks/folders or add open bookmarks to this newly created folder. This use flow is made easier to accomplish by sorting folders by most recent when a user bookmarks a link from the url bar. As can be seen in my test case below, I’ve created 3 folders, with #3 being the most recently created folder, and those folders show up in chronological order, in addition to Movies and Investing which were the other most recently accessed folders. The chooser also allows the user to add to the Bookmarks Bar (The default behavior in fact and likely the correct default for most users) or Other Bookmarks (I.E. -> Not on the Bookmarks Bar, also likely the correct default for most users). Compare Google Chrome’s behavior to Apple’s Safari Browser below, where I have created the same 3 dummy folders, but when I go to bookmark HackerNews, the default is the Favorites folder overall (again likely the correct choice for most users), but in the dropdown folder chooser, the folders show up in reverse chronological order (likely the incorrect choice for most users). Safari’s behavior becomes even sillier if you have a high number of folders, as can be seen in image #3. Google Chrome’s “Choose Another Folder” option is a much better experience.